How IT spending is related to profitability is to find two comparable enterprises and observe their differences. These findings do not support that long-health view that increased IT spending will improve income. Good data about IT spending as well as for other financial indicators is available from the Annual Reports of US banks. That shows initially similar financial results but continuation of major differences between IT spending and other financial results. 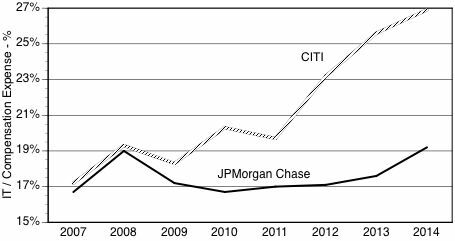 During the recession of 2008 CITI lost revenue from which it never recovered. 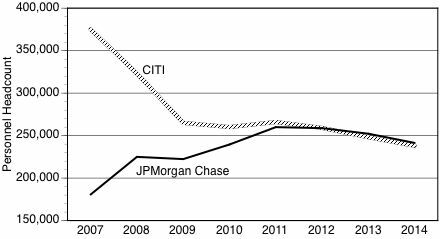 During the recession of 2008 CITI incurred loss in profit from which it could not recover for matching JPM Chase profits. JPMorgan IT costs continue steadily in line with the profitability. CITI IT as subject to major disturbances. 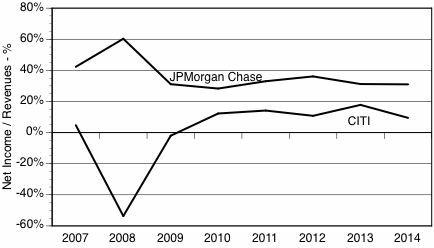 Compensation at JPMorgan Chase does not appear to influence IT spending. Figure 6 - Lower CITI Headcount Does Not Lower IT Costs (GFILES6). 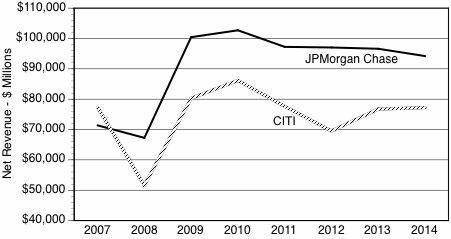 The equalization of bank headcount after 2011 did not reduce in a reduction in IT spending. A steep increased in IT spending per payroll dollar should be used as a significant indicator of IT performance. This comparison of audited amounts for comparable firms (e.g. 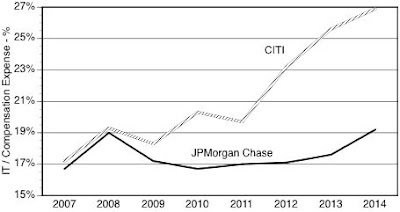 CITI and JPMorgan Chase) shows that there is no correlation between IT spending and any other financial indicators. This conclusion demonstrates that the long held assumption from the MIT Sloan School about correlation of IT with profits does not hold.